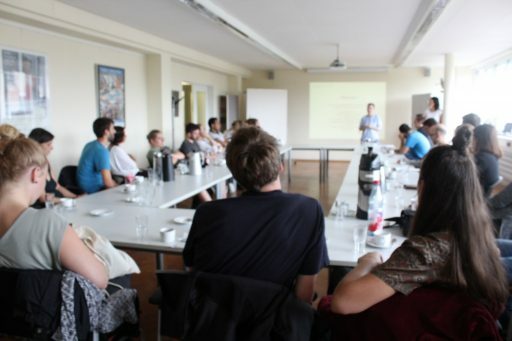 We were group of 32 youth, gathered in Frankfurt am Main from 8th to 14th for the seminar of Be Boarder Free. 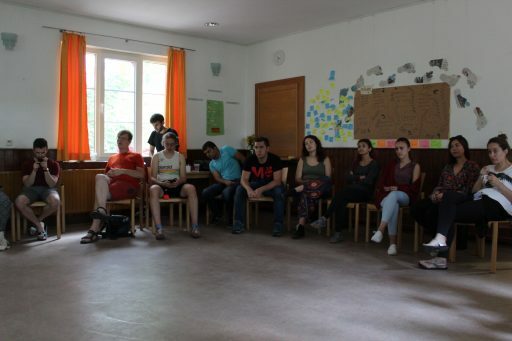 It was an international group with various nationalities: Albania, Armenia, Belgium, Czech Republic, Ethiopia, Germany, Hungary, Iran, Italy, Japan, Latvia, Macedonia, Philippine, Poland, Portugal, Romania, Syria, Slovakia, Sweden and UK. 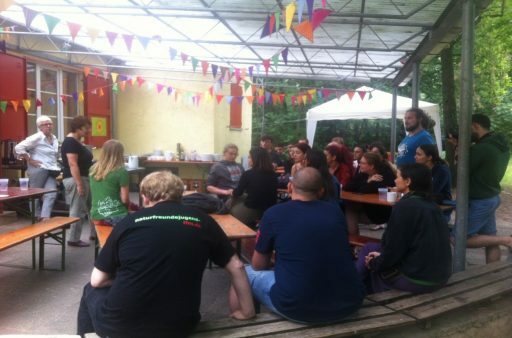 The some of the members of Naturefriend Frankfurt came to welcome us. In the collaboration of our three trainers, Ana Teresa, Falko, and Mohammed, we started the seminar with the ice breaker activity of introducing ourselves to the group and moved to the activity of writing what we would like to share and like to learn during this week on the colored papers. Put them on the wall of the conference room where we had most of our activities. During the week, we would come back to our own paper and move them around the program of the seminar according to the progress our sharing and learnings. Followed by several team building activities indoor and outdoor: human statues, hand hypnosis, collective stick raising and etc. 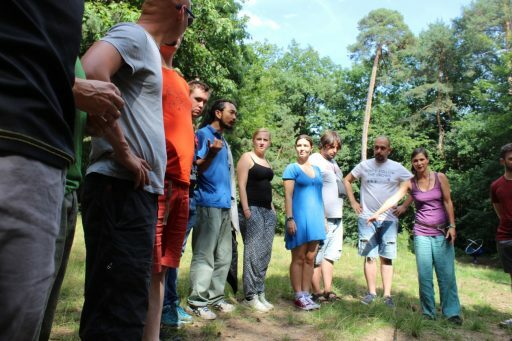 Every team building activity was, at some degree, connected to the theme of the seminar “Boarder free solidarity”. For example, the simulation game “Dardians” which we played during the seminar. We split the group in two: the smaller group “experts”, and the larger one “dardians” (people from the imaginary country, called Dardia). Both group was handed the text of the background information with the objective of the activity (which was same for both groups: to build a bridge in Dardia) and rules of it respectively (which, of course, caused various complications for us to achieve the objective of the game). One of the rules for (characteristic of) Dardians was that they cannot help screaming when somebody passes by or talks without having physical contact with somebody else. We, dardians decided to start practicing this idiosyncratic behavior during the preparation time within our group before the simulation part began. As the photo below shows, we discussed our strategy for the game holding hands of each other: Boarder free solidarity spirit. As days passed, the walls of our conference room began covered by posters, papers imbued with our ideas and drawings with our ideals. 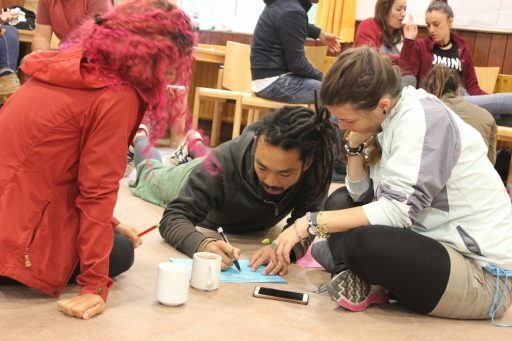 We brainstormed the ideas of our own guidelines of the youth work for the refugee communities, and agreed on having: Reality, Examples, Method and Tools for the body of our guidelines. We did the field visits to the local refugee camps and to the local experts of the refugee works; Project Shelter, AMKA, and Afghan refugee movement. The knowledge and experiences we gained from these field visits are elaborated in the part Reality and Examples of our guidelines. Many times, during the seminar, we divided our group into smaller groups and exchanged our ideas for crafting each category of our guidelines. GIAN-Giò suggested the series of activities we did in the spring gathering ´17 in Piemonte for one of the methods of the guidelines. Once we agreed on within smaller groups, we presented the ideas of the group to the whole group and reflected them collectively. Having composed the introduction and conclusion, after 7 days of working together, we collectively made a draft of our guidelines. Through the experience of not only going through the intensive program together, but also having meals together, activities outside of the program such as playing volley ball, tree climbing, and chatting over a cup of coffee, the group started feeling solidarity within. The solidarity of 32 youth from 20 different countries. The editing committee has been working to put our draft of the guidelines into the form of the digital book.